This is such an elegant dish that looks complicated but is quite easy to make. 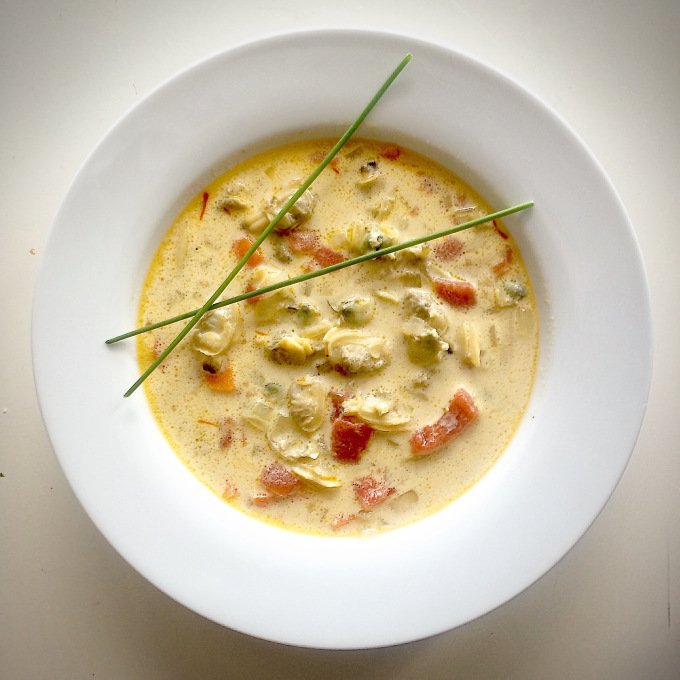 It’s creamy and flavourful with sweetness from the onions, carrots, and tomatoes as well as a hint of saffron. I used big and baby clams to give the soup texture and bulk. I imagine this is something I would eat by the seaside in the summer, even though it would be perfectly fine for a cold winter’s day. Melt the butter in a large pot or dutch oven over medium heat. Add the onions, carrots, garlic, salt, and pepper. Sauté, stirring occasionally until onions have softened. Add the white wine and saffron. Reduce the heat to low, cover, and simmer for 20 minutes. Add the tomatoes and cook for another minute. Add the fresh and canned clams with liquid and simmer uncovered for 5 minutes. Add the milk, and the cream. Heat until just heated through but not boiling. I used baby clams which are canned and come in their juice. Fresh clams would be ideal for this bisque, but I couldn’t find fresh clams that weren’t de-shelled. My grocery store had a package of frozen ones so I used those. Either way is fine, it’s just what is available to you. The preferred would be the fresh clams which is why I have it in the recipe. If you are able to get all your clams fresh you will want to buy clam juice to add to the bisque. I garnished with herbs and have had this with both dill and chives. I use a little bit of dill which compliments it but doesn’t over power the dish. When I use chives I sprinkle a lot on. It brings a freshness to the dish. You could also use parsley. Adding some fresh herbs at the end is a really nice touch.